Here’s a review of Homophonic by Amy Bastow, presenter of “kiss my arts” on Joy 94.9fm. Also! Click through to hear the podcasts of “Kiss my Arts” on the air. Show six is the review, (segment starts around 3:20) and show three features an interview with 3 Shades Black director Miranda Hill. Thanks Amy! We can’t wait to work with you again! A nice review of our show in the Melbourne Fringe Festival last year! Press – Sometimes Melbourne Interview. The lovely team over at Sometimesmelbourne.blogspot.com are doing features on upcoming shows in the Fringe Festival. Thanks for the interview! We’re really heading into heady Fringe time now… Festival starts tonight! Thanks for the shout-out, Experimental Melbourne! Fringe Hint – Come see Moving Scores! Meet the Groupies – Advance edition. 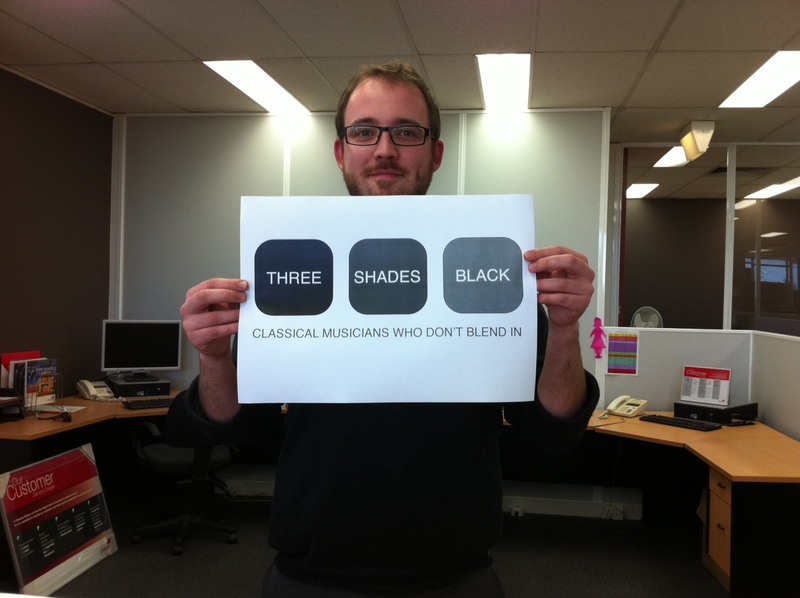 Nick brings his love for 3 Shades Black to the suburban workforce. Represent!